Inhabiting rainforest regions from Nicaragua to Bolivia resides a remarkable family of tropical frogs. The family Dendrobatidae , divided into the genera Dendrobates, Phyllobates, Epipedobates, Allobates, Minyobates , Colestethus,and Aromobates (some authorities also recognize a further genus; Phobobates ) contain some of the most spectacularly coloured animals on earth. 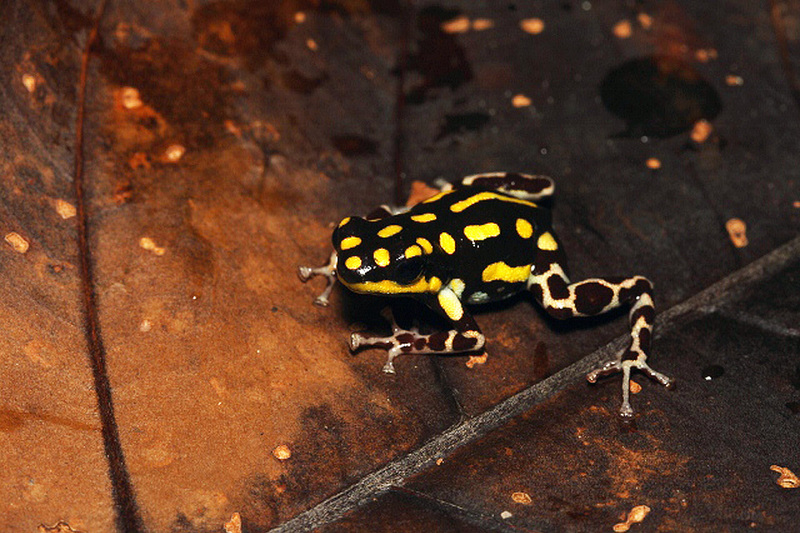 A prime example of aposematic colouration, the bright colours on these generally small (.5- 2mm) frogs warn any would be predators of their un-palatability. Due to secretions of a variety of toxins and alkaloids from glands located under the skin, wild poison frogs are free to hop amongst the understory by day, virtually free of predation. Remarkably these often delicate looking creatures fare very well in captivity provided that a few necessary requirements are met. Keeping poison frogs in living vivaria has been popular for many years in Europe and over the last decade has become increasingly popular in the United States, and more recently has started to increase in popularity in Canada. A ten gallon aquarium can easily be furnished to house a pair of dart frogs. First place a layer of kitty litter, LECA, or pea gravel to a depth of 1-2 in the bottom of the aquarium. This layer will act as a water reservoir of sorts, as water will drain through the soil layer, and into this bottom layer. On top of this base layer, a layer of soil substrate can be added. There are a variety of opinions on which soil mixes are best, I prefer to use a mix of potting soil, peat moss, sphagnum moss, orchid bark, and sand, all in roughly equal proportions. This mix seems to allow for good drainage, and the plants thrive in it. Ponds can easily be added to this set up by simply removing the base and substrate in an area where you wish the pond to be. Plants can then be added. There are many suitable plants ; some of the most reliable are various pothos, philodendrons, pepperomias, and calatheas. If you have a green thumb, you may wish to try some more delicate plants such as bromeliads and orchids. Provided that they are kept under acceptable conditions, most poison frogs will reach maturity between 12-18 months, with some in as little as six months. Breeding is possible soon after. Most poison frogs are rather willing to breed. When ready the males will begin to vocalize, and the female will swell with eggs. If the female is ready, she will follow the calling male to a suitable bower in which breeding will take place. This location is often a secluded location, such as a coco-hut, or inside a curled leaf. If the eggs are fertilized, development will be apparent after about 3 days, and tadpoles should emerge after 10-18 days depending on the species. Tadpoles of the D endrobates should be raised individually (they are cannibalistic), and fed a diet of spirulina, chlorella, and nettle. Sera Micron is another excellent tadpole food. Tadpoles should morph into froglets at about 2 months time, and can then be fed pinheads, fruit flies and springtails. Whether your are just starting out with herps or an experienced keeper, poison frogs will make a rewarding addition to anyone’s collection. Good luck!